Saturn is about 9 times larger than the Earth. Because it is a "gas giant" planet, its volume is much bigger in proportion to its mass. Saturn's density is eight times smaller than the density of Earth. Due to its low density, rapid rotation, and fluid state, Saturn is flattened at the poles, and bulges out at the equator. The equator radius is 10% larger than the pole radius. Saturn is 30% less dense than water, the only planet in the Solar System to be less dense than water. Saturn has several layers of clouds, just like the other planets. These clouds are made up of water ice, ammonium hydro-sulfide ice, and ammonia ice. Above the clouds are gaseous hydrogen and helium. The winds on this planet reach to speeds of 1800 km/h. A "Great White Spot" has been observed on Saturn several times. This spot is a storm occurring every Saturnian year, or every 30 earth years. Next such storm is expected to happen around 2020. The south pole features an unusual phenomenon, a cyclone that is warmer than the rest of the planet. By contrast, the south poles on Earth and other planets, are the coldest places on the planet. The north pole has a very unique feature too, a persisting hexagonal wave pattern. The sides have straight edges, each approximately 13,800 km long. The entire structure rotates with a period of 10h 39m 24s. That is the period at which the interior of Saturn is believed to rotate. This hexagonal structure does not shift in longitude, like the clouds of Saturn. It takes 29.5 earth years for Saturn to orbit around the Sun. Saturn has a lot of moons, 62 were so far discovered. 9 of these moons don't even have an official name yet. That is not counting the "moonlets" within Saturn's rings. The largest moon of Saturn is called Titan. It is the second largest moon in the Solar System. Planet Mercury is smaller than this moon. It even has an atmosphere, the only moon in the Solar System to possess a significant atmosphere. And it comprises 90% of all mass orbiting Saturn. Saturn's second largest moon, Rhea, may have a small ring system of its own, and a minor atmosphere. The other moons are much smaller. 34 of them are less than 10 km in diameter. Saturn's rings extend from 6,630 km to 120,700 km above its equator. On average, they are 20 km thick. They are composed of 97% water ice, and 7% amorphous carbon. The particles making up these rings can be as small as a spec of dust, or as large as a small car. There are two theories on the origins of these rings. One is that they were created there in the first place. And the other one is that they are remnants of a shattered moon of Saturn. Beyond the main rings, at a distance of 12 km from the planet, is a unique ring, called the Phoebe ring. It was named after one of Saturn's moons. Like the moon Phoebe, it rotates in the opposite direction to the rotation of Saturn. Phenomena like this, are very common in space; suggesting space objects were uniquely designed, rather than spinning out from an initial dense dot of matter. Saturn has been observed since the beginning of time. Babylonian astronomers observed and recorded the movements of Saturn on a regular basis. In ancient Roman mythology, Saturn was worshiped as a god. Saturnus was a Roman god of agriculture and harvest. In Hindu astrology, Saturn was one of the nine astrological objects, and called, "Shani". In the 5th cetury AD, Indian astronomers estimated the diameter of Saturn with a 1% difference from the currently accepted value. 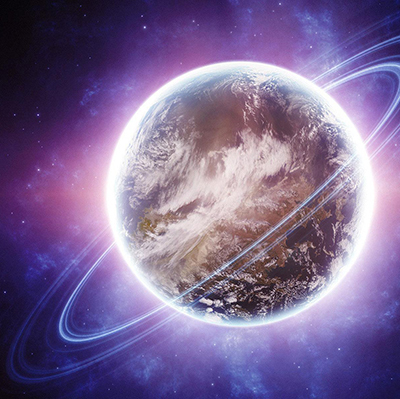 Ancient Chinese and Japanese culture designated this planet as the "earth star". In ancient Hebrew, Saturn was called "Shabbathai". European observations begin with the 17th century. In 1610 Galileo discovered Saturn's rings, but called them moons. Christian Huygens determined that they were rings, and also discovered Titan, Saturn's largest moon. With invention of better telescopes, more moons of Saturn were discovered. As far as we know, the first spacecraft to visit Saturn, was Pioneer 11, in September 1979. It took low resolution images of Saturn, its moons, and its rings. It determined that the "dark space" between the rings was not empty. It also measured the temperature of Titan. In 1980 and 1981, Saturn was visited by Voyager 1 and Voyager 2 spacecrafts. These flybys helped with performing better study of Saturn's atmosphere and rings. Cassini Huygens space probe was launched with a dedicated mission of studying Saturn. It entered into the orbit of Saturn, and made a close flyby of its moon Phoebe. It also made a flyby of Titan, taking pictures of its large lakes and coastlines with their numerous islands and mountains. On January 14, 2005, Huygens space probe was descended on the surface of Titan, sending a flood of data during the decent. Since early 2005, scientists have been observing lightning on Saturn, which is 1000 times more powerful than lightning on Earth. In 2006, NASA claimed to find evidence of liquid water reservoirs on the moon Enceladus, which erupted in geysers. Images have shown particles of liquid water emitted by icy jets and towering plumes. In 2007, images from Titan showed large hydrocarbon "seas" at the moon's north pole, largest of which is the size of the Caspian Sea. Saturn can be easily seen with a naked eye. Binoculars of at least 20x will help to resolve the rings of Saturn.